GZIP'ed and BZIP2'ed files are also detected automatically and decompressed on-the-fly. The timeline view shows a histogram of messages over time. The number of warnings and errors are highlighted in the display so that you can easily see where problems have occurred. Once you have found a period of time that is of interest, a key-press will take you back to the log message view at the corresponding time. The pretty-print view will reformat structured data, like XML or JSON, so that it is easier to read. Simply press SHIFT+P in the log view to have all the currently displayed lines pretty-printed. The built-in log message parser can automatically discover and extract interesting data from plainly formatted log messages. 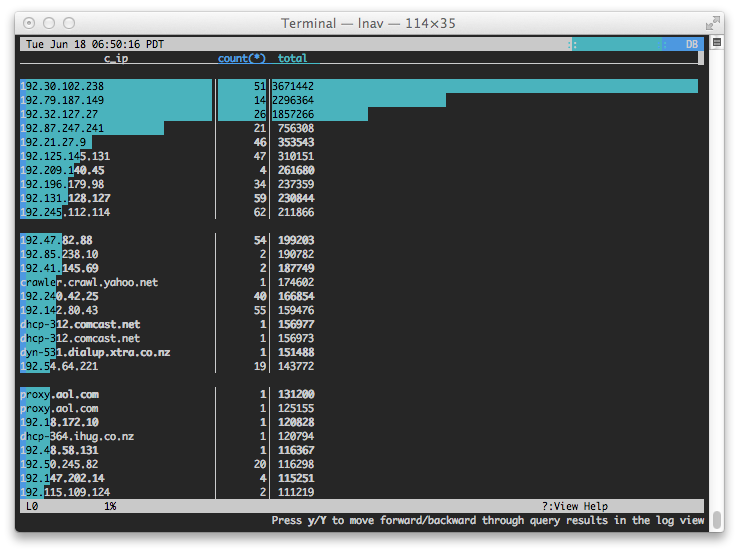 For example, the screenshot above shows the key/value pairs extracted from a sudo log message. These pairs can then be accessed using SQL. Errors and warnings are colored in red and yellow, respectively. Highlights are also applied to: SQL keywords, XML tags, file and line numbers in Java backtraces, and quoted strings. The search and SQL query prompt are also highlighted as you type, making it easier to see errors and matching brackets. When doing a search, the regular expression syntax is highlighted as you type. The command prompt supports tab-completion for almost all operations. For example, when doing a search, you can tab-complete words that are displayed on screen rather than having to do a copy & paste. Starting a search for "7043" and then double tapping TAB shows what completions are available. Session information is saved automatically and restored when you are viewing the same set of files. The current location in files, bookmarks, and applied filters are all saved as part of the session. Support for Mac OS X and Linux.